TOP FLIGHT ADVANCED ACADEMY STUDENTS: Twice-per-week Top Flight Academy students are eligible for complimentary walk-on court time*. Walk-on court time is defined as an open court that is immediately available and cannot be reserved prior to one-hour before play. Walk-on court time can be reserved in one-hour increments. If the court is still available after one-hour of play, you may play up to an additional hour. All players on court must either be twice-per-week students (for free walk-on,) or pay for their portion of the court time. Players must call or talk to someone at the club before play. Club ball carts are not to be used by members/players. Please provide your own balls for court time. Cans of ball can be purchased from the club if necessary. 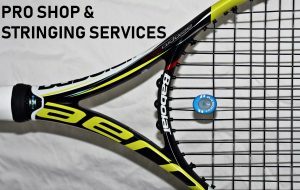 Ball Machine Rental – Ball machine rental is $15 per hour, not including court rental fee. Ball Cart – We have a member ball cart available for rental at $10 per hour. Please inquire at the front desk.